A tense environment is reeling round the Sikkim border where Indian and Chinese troops are locked in a standoff. While Beijing jumped into the matter and demanded the withdrawal of Indian troops from the Sikkim sector as a precondition for “meaningful dialogue” to resolve the situation, India expressed its deep concern over China constructing a road in the disputed Doklam area near Sikkim. In a message to Beijing, the Government said that any such would represent a significant change of status quo with “serious” security implications for India. Meanwhile, Sikkim government has prepared and sent a report to the central government giving details of the situation along the border following the standoff. – China has removed an old bunker of the Indian Army located at the tri-junction of India, China and Bhutan in Sikkim by using a bulldozer after the Indian side refused to accede to its request, reported PTI quoting its officials. – India on Friday hit back at China for making veiled threats with Defence Minister Arun Jaitley asserting that India of 2017 is different from what it was in 1962, even as New Delhi told Beijing its actions near Sikkim have “serious” security implications for this country. – India also treats the June 26 statement by the Chinese foreign ministry that Indian border troops crossed the boundary line in the Sikkim sector of the China-India boundary and entered Chinese territory as factually incorrect. India has always maintained that there is no China between the Sikkim and Bhutan border. – A high-level meeting on Friday reviewed the situation in the Sikkim sector where tensions have flared up between Indian troops and Chinese military over the construction of a road by China in a strategically key area near the Sino-India border, as per PTI report. – The first batch of Kailash Mansarovar pilgrims, a shrine dedicated to Lord Shiva, comprising about 50 people returned from the Nathu La border post as a result of the standoff between India and China. The second batch of pilgrims did not move from Gangtok and pilgrims were told to go home as the Kailash Mansarovar pilgrimage is unlikely to continue this year via Nathu La. – Amid the ongoing tension between the troops of the neighboring country, Bhutan had earlier accused China of directly violating the agreement between them by constructing a road inside its territory. It asked China to stop constructing the motorable road from Dokola in the Doklam area towards the Bhutan Army camp at Zompelri as it will affect the process of demarcating the boundary between the two countries. – China took no time to reject the claim of Bhutan on the issue of road construction arguing that the Doklam area in the Sikkim sector has been a traditional pasture for Chinese cattle grazers over which it has historically exercised “complete and comprehensive” control. – In Beijing, Chinese Foreign Ministry spokesperson Lu Kang indicated that the point of friction was in the Donglong (Doklam) region, which he stressed belonged to China indisputably. – India’s army chief Bipin Rawat had on Thursday visited the mountainous state of Sikkim bordering China, where tensions have flared after Beijing accused New Delhi of sending troops into its territory and obstructing the construction of a road. Small incursions and troop stand-offs are common along with other parts of China and India’s contested 3,500 km (2175 miles) frontier, but a flare-up near strategically positioned Sikkim is rare. – China issues safety advisory for its citizens in India. Why India has upper hand in Border-Row at Sikkim border? 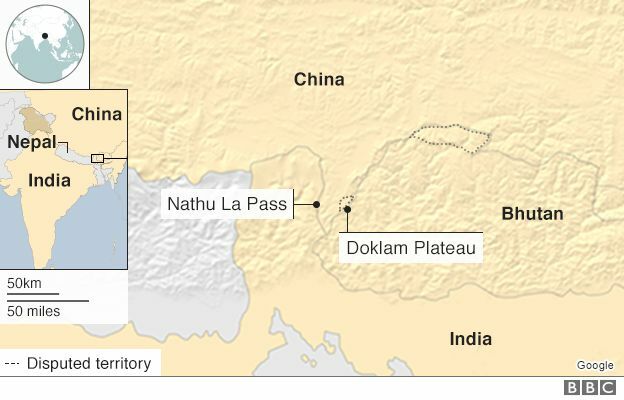 The standoff is necessary – a withdrawal will result in Chinese troops advancing and occupying not only the entire Doklam plateau, which is Bhutan’s territory, but also extending the tri-junction of India-Tibet-Bhutan about 10 kilometres south of the present position. And that would make the Siliguri corridor, which connects North East India with the rest of the country, vulnerable. Behind the human chains, both sides have amassed troops and military hardware. China has even been conducting military exercises simulating battlefield scenarios. The Chinese have also reportedly tested the Xinqingtan, a new 35-tonne battle tank with a 105 millimetre tank gun, a 35mm grenade launcher and a 12.7mm machine gun. Sounds of artillery and gunfire can be heard from the Indian side many miles away. The Chinese are, obviously, making a lot of noise on Ground Zero. It is not as if the Indian Army (IA) and the Royal Bhutanese Army (RBA) have been sitting pretty. A lot of armoured, artillery, mechanised infantry and infantry units have been amassed. The IA and RBA are conducting joint exercises to test their combat readiness and coordination. The coordination between the two armies is smooth; not only do the two share extremely close ties and hold regular exercises, the RBA is also trained by the IA itself. IA officers are, however, not quite impressed by the sound that China’s People’s Liberation Army (PLA) is making at Doklam and further south at their side of the existing tri-junction (Map credit: Rohit Vats). Indian and RBA troops and units have dug in their heels and are well prepared for the long haul. But its not only that. Both the IA and RBA occupy the higher ground at Doklam and Doka La. And, thus, they have a significant strategic advantage over Chinese troops, who are amassed at the narrow Chumbi Valley. The Chinese have not been able to encroach much into the Doklam plateau and beyond the present trijunction into Doka La area. The Chinese started encroaching slowly and stealthily into Doklam plateau from Chumbi Valley a few years ago. A part of that plateau – about 89 sq km of it, according to Bhutan – is disputed territory between Bhutan and China. But even though treaties exist between the two nations to maintain status quo in such areas, the PLA has been surreptitiously encroaching into Bhutan’s territories. China has built roads from Chumbi Valley to a high mountain pass called Senche La that leads to Doklam plateau in Bhutan. This road then enters Bhutan before turning west to return to Chumbi Valley. The Chinese have also extended this road down southwest till Doka La, a few kilometres into Indian territory. As they have been doing in other sectors, the Chinese now cite the existence of this road, and their own bunkers and temporary positions in encroached-upon territories, to claim them as their own. 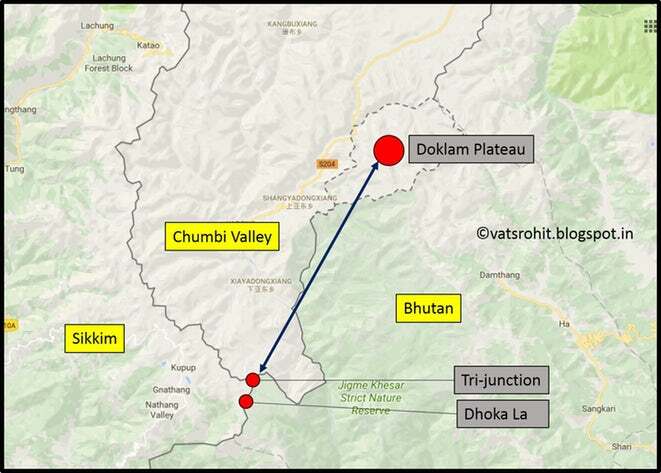 As can be seen on the map given below, China wants to push the India-Tibet-Bhutan tri-junction further south to make Doka La, which is now well within India, into a pass that opens to the Chumbi Valley. The blue line in the map is the present boundary between Bhutan and Tibet; the blue line marks the Chinese claim on Bhutan’s territory that would push the tri-junction further south. The Chinese want to do this for many reasons, the primary being strategic. If the Chinese can push the tri-junction south and occupy the Doklam plateau, they will gain tremendous advantage over the IA and RBA. The vital rail and road links passing through Siliguri corridor would then come within easy range of Chinese artillery from the new tri-junction. That will give China a huge advantage over India since India, aware that China can easily snap links between the North East and rest of India, will then be at the mercy of China. Beijing will be able to bend New Delhi to do its bidding. If the Chinese game plan succeeds, Beijing would have effectively humbled India and delivered a debilitating blow to India’s ego and prestige. Beijing would also have demonstrated to India’s neighbours that China is the big brother in this neighbourhood and they can safely ignore India. Also, Beijing would be able to force Bhutan to deal directly with China instead of through India, as it happens at present. But this scary scenario is highly unlikely. That’s because the IA and RBA still hold onto the strategic heights and China has not been able to move enough PLA troops and military hardware onto Doklam plateau to pose any serious challenge to Indian and Bhutanese armies. It would, say IA and RBA officers, be easy to push PLA troops and units back to Chumbi Valley. China has, admittedly, amassed a large number of troops, artillery and armoured units in Chumbi Valley. But these are sitting ducks for Indian artillery now. Chumbi Valley is also within easy range of Indian Air Force fighters based in the Siliguri corridor and south Bengal while IA and RBA positions in Doklam are quite out of range of the PLA’s Air Force stationed in Tibet. This ground reality is what riles Beijing no end. China knows that it cannot start hostilities on this front since it is still at a severe disadvantage. And that is why the Chinese military, its foreign office and the state-controlled media as well as state-sponsored think tanks are spitting fire on India. The knowledge that if the PLA fires the first shot in Doklam, it will suffer huge losses there, and in the Chumbi Valley as well, is what proves to be a huge setback to China’s expansionism and severely dents its gargantuan ego. And hence all the angry noises emanating not only from behind Chinese positions in Doklam, but also from faraway Beijing. ISRO PSLV-C38 launch: What is Cartosat-2 series satellite?